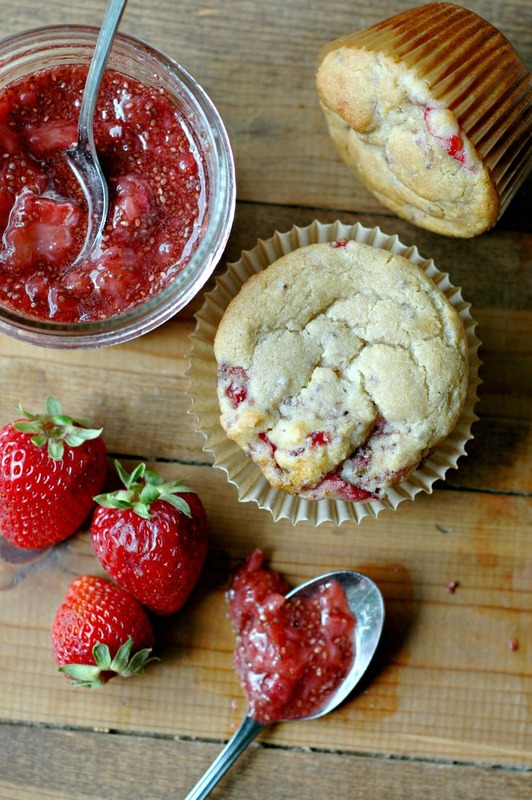 Paleo Strawberry Chia Jam Muffins :: Grain & Dairy Free :: Works With ANY Flavor Chia Jam! 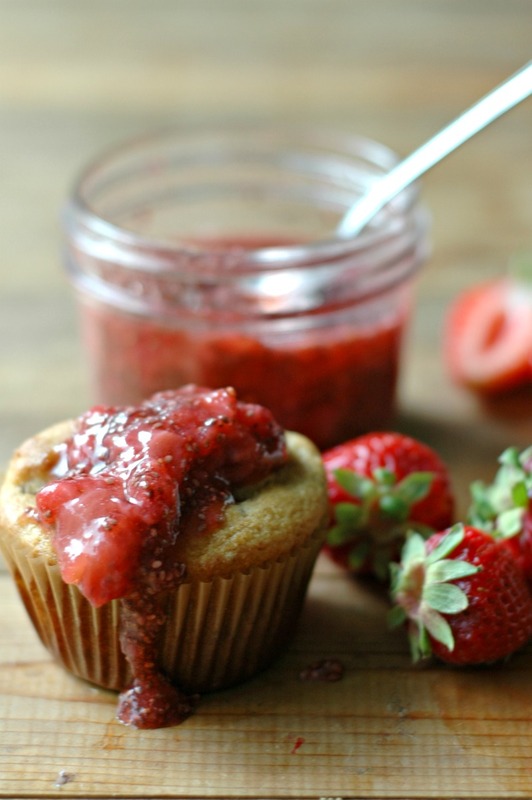 Sweet strawberry chia jam swirled into soft Paleo muffins, perfect for breakfast on the go! 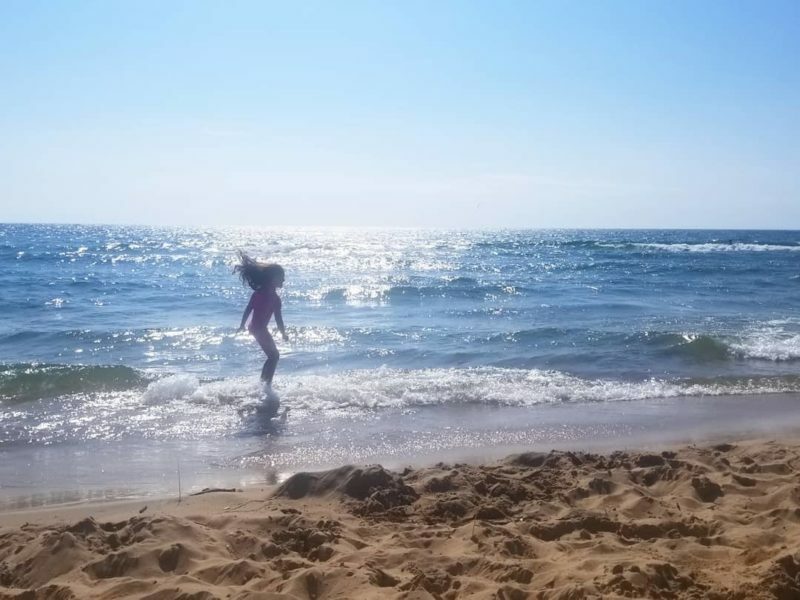 This really has nothing to do with strawberry chia jam muffins, but we’re right in the thick of summer, and we are pretty much parked at the Lake Michigan shoreline daily! That warm powdery sand and crystal clear fresh water makes for the best evening playground to wear out kids of every age for bedtime, and we take full advantage of it being right in our backyard! We picked strawberries last week, and boy this heat has them turning so fast! 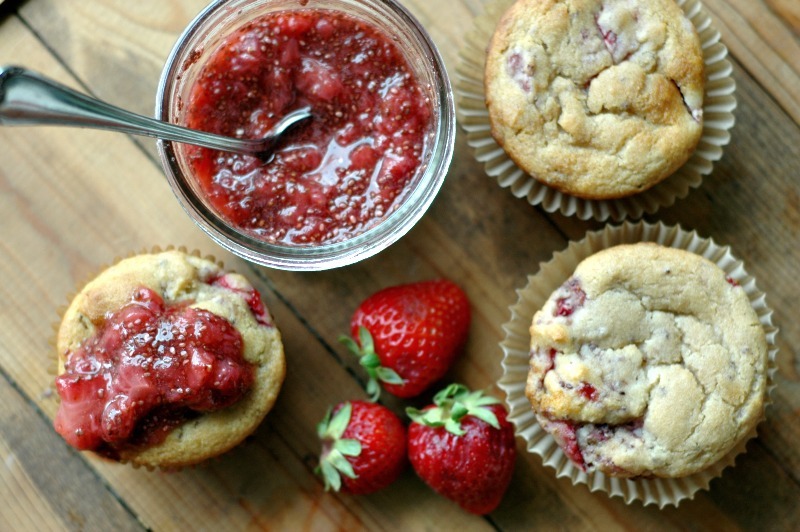 I used the last bit of strawberries that were turning too fast to make some chia jam so that it wouldn’t go to waste, and as one of my girls was spreading it on her banana muffin for breakfast one morning, I had an idea! That chia jam would be so amazing swirled right up into a breakfast muffin! Summer’s best produce jammed up…chia style! I was pretty late to the party jumping onto the chia jam train. I know it’s all the rage, but there was just something about that once a year task of choosing a summer fruit and cooking it down for jam that was so satisfying! Last year I just didn’t have the kitchen time to spend making traditional jam for our strawberries, and really fell in love with making them into chia jam. 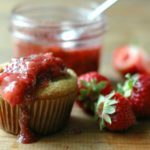 This muffin recipe will really work with whatever chia jams you are making this summer, and better yet, if you are jamming up the traditional way, that jam will work too! Really any summer fruit will work just fine! Almost tipping on the addicting side of things, the texture of these muffins are perfectly soft and satisfying. You’ll never know they aren’t loaded with gluten! Not only are they gluten free, they are free of grain too for those following more of a Paleo lifestyle or need to avoid grains for gut healing. 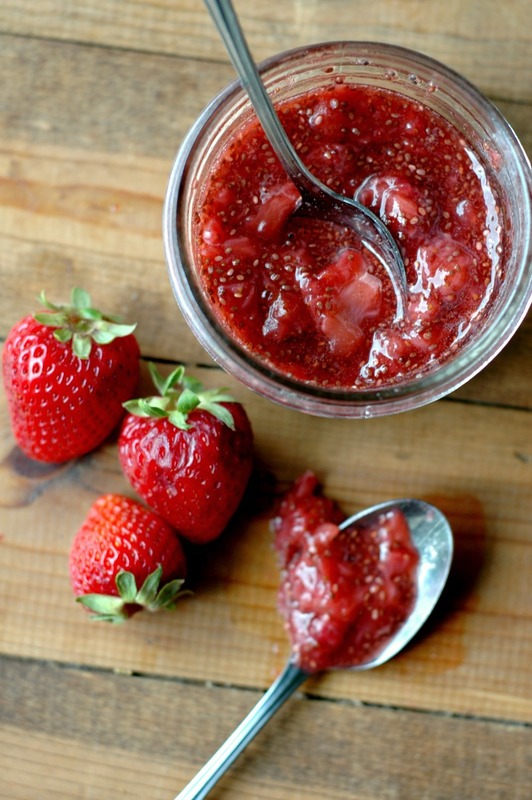 If you have already canned your favorite summer fruit jam, you can use that for this recipe! Or, if you are done picking fruit, and only have store bought jam on hand, you could use that too. The chia jam recipe I will leave in this post is a super basic chia jam – always about a cup of fruit to a tablespoon of chia seed and sweetener to taste. I think if you have some real little guys in the house you could get away with just a half or so tablespoon of the honey for that jam. If you are going to use store bought, just watch the ingredient list and be sure there isn’t anything funky added to the list. I haven’t tried these muffins egg free, but if you don’t tolerate eggs, I do think a couple gelatin or chia “eggs” would work in here. There are only 2 eggs in the whole recipe so that usually swaps out ok. The muffins might not puff up as much since the eggs make that happen, but they will hold together and still taste really good. The only flour swap that I have made is the Namaste Gluten Free Flour – that will work to swap for all of the cassava, almond, and coconut flours if you happen to have that on hand and prefer to use that. I love the nutritional profile that the specialty flours give to add to breakfast, so that is why I love those other flours. If you are nut free, I do think that using all cassava flour would work. Ohhh yes they are freezer friendly! As you move through your summer, picking and enjoying all the special fruit that the warm summer months have to offer, make a batch of chia jam muffins to preserve the fruit! Stashing them away will make your school morning breakfasts easy peasy come fall! To freeze, simply let the muffins cool completely to room temperature, and then put them in a freezer bag. The texture stays super soft even after they thaw out! ½ cup plain full fat coconut yogurt I get big 32 oz tubs of the SoDelicious brand at the store. You can use homemade coconut yogurt, or if you tolerate dairy, you can use plain full fat regular yogurt. Put the strawberries and maple syrup in a small saucepan over medium heat. Squish the strawberries with a potato masher and let them cook down and break apart over medium/medium-low heat for about 8 minutes. 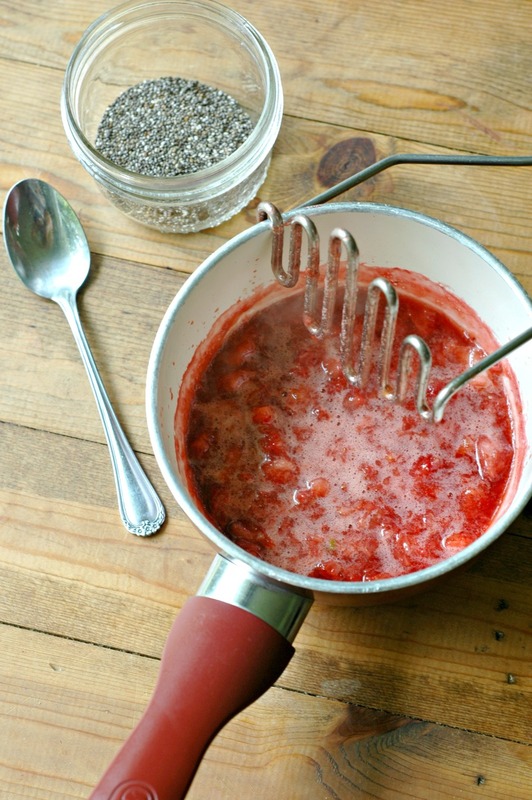 Pour the chia seeds into a small jar, pour the cooked strawberries over the top, and stir to combine. Place the jam in the fridge to set up. This will take an hour to cool off and set up. When you are ready to make the muffins, pre-heat the oven to 350 degrees. Blend the oil, honey, vanilla, and eggs in a medium mixing bowl for 2 minutes. Add the milk, yogurt, flours, baking powder, baking soda, and sea salt and blend to combine. In a separate small bowl, stir together the diced strawberries with the strawberry chia jam, and then fold the jam/strawberry mixture into your batter. 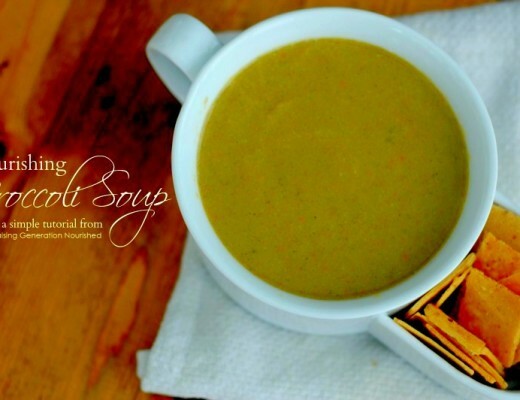 Don’t stir this too much – you are going for more of a swirled look. Scoop the batter into silicone muffin cups or paper muffin cup lined muffin pan, and bake at 350 degrees for 25 minutes. Recipe makes about 16 muffins. Let the muffins cool the pan for 5 minutes, and then put them on a cooling rack to cool completely. They will come out of the paper liners or silicone cups the best when completely cooled. This is such a fun idea!!! I never would have thought of that! The texture of the muffins looks so perfect too, I bet your kiddos love when you make them. I was just coming to your site for some strawberry recipes as we just picked some today. Can’t wait until these finish baking! Your recipes never disappoint. Awesome Sarah! I hope you enjoyed them! Such a good idea to use up any jam but especially chia jam! I am always looking for ways to incorporate more chia in recipes and this would be a good one. I am also thinking topping pancakes with chia jam would be delicious. I have yet to board the chia jam train, although I really want to do it. I seem to be just missing local strawberry season wherever I travel this spring and summer. These muffins look wonderful! Update: I’m making chia jam tonight! I bet these are delicious!! And so welcome for the kids on the go. I love all your descriptions of your lake! I want to come!! 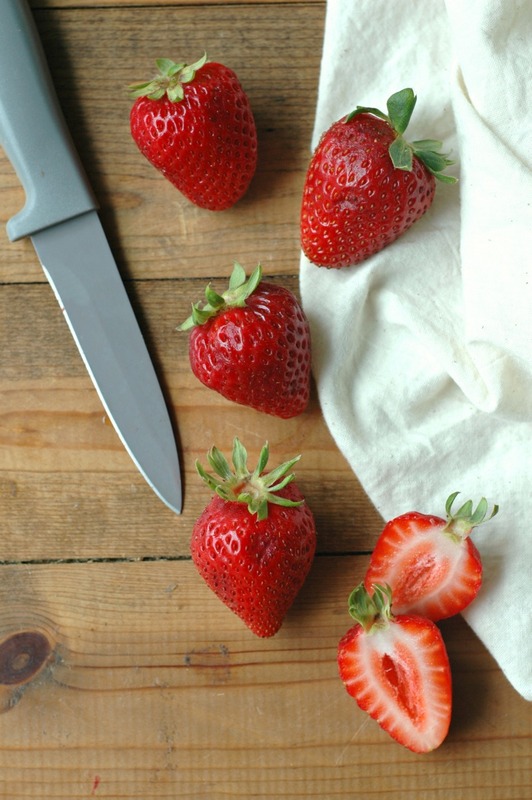 These are gorgeous and just in time for all those in season strawberries! 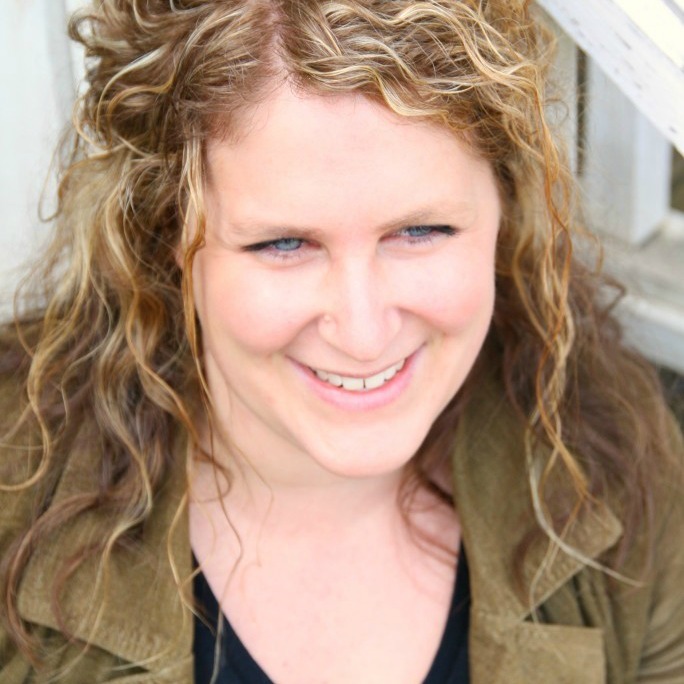 This is such a great idea – why didn’t I think of that! In fact, we went blackberry picking today and I’ll bet I could make these with blackberries. 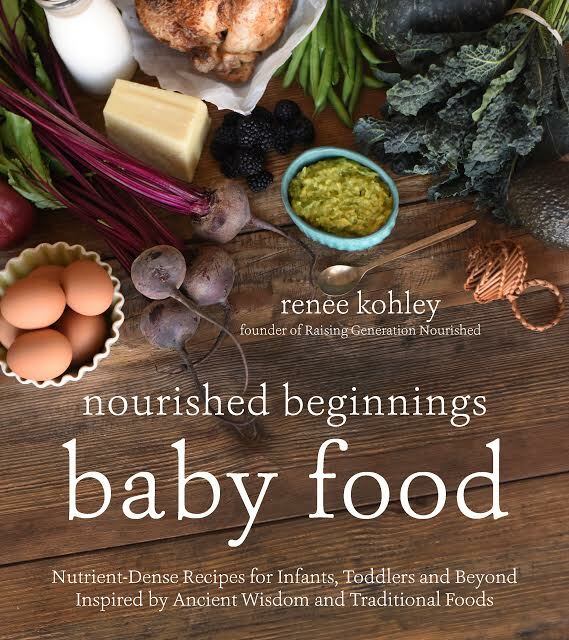 I’ll bet my kids would gobble it up! Love this healthy twist on muffins! I love chia jam and this looks so delicious. I am 100% making these!! Obsessed with chia jam at the moment, I am making it almost weekly, can’t get enough. Now I have another delicious way to use it! 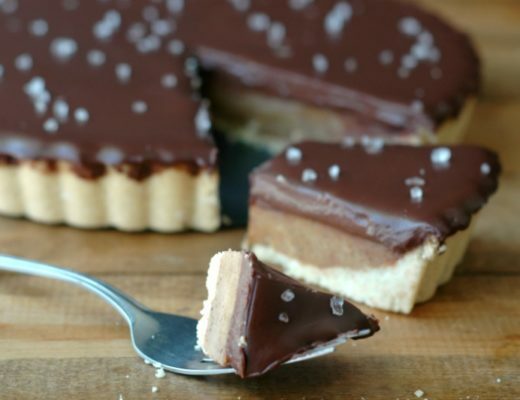 The texture, the freezer friendliness, the versatility of flavors… I’m in love with this recipe! Also, I’ve never combined cassava and almond flours before, but I’m going to now! I bet that is key to perfect, fluffy texture! Those look so delicious! I know my kids would love them! Now thats a great idea. Never heard of chia in jam but I’m sure it must awesome. Gotta try this. 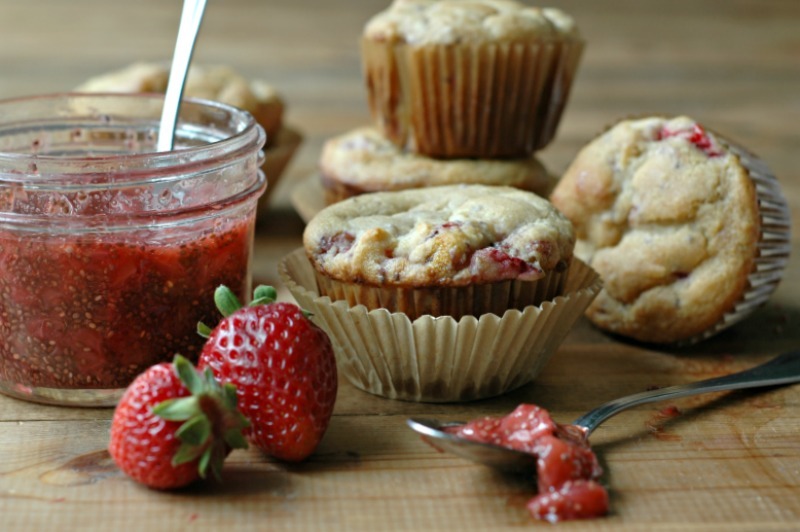 I love muffins for grab and go breakfasts in the summer, and these strawberry chia ones look incredible! Also just love the beach photo, I thought you were at the ocean because the sand was so fine, all our beaches here are very rocky and it’s rare to see sand! I still haven’t tried out chia seed jam and these muffins would be something healthy my kids could have for breakfast. While they are home during the summer months we also seem to need a lot of grab and go snacks too and a healthy muffin would be a great option. 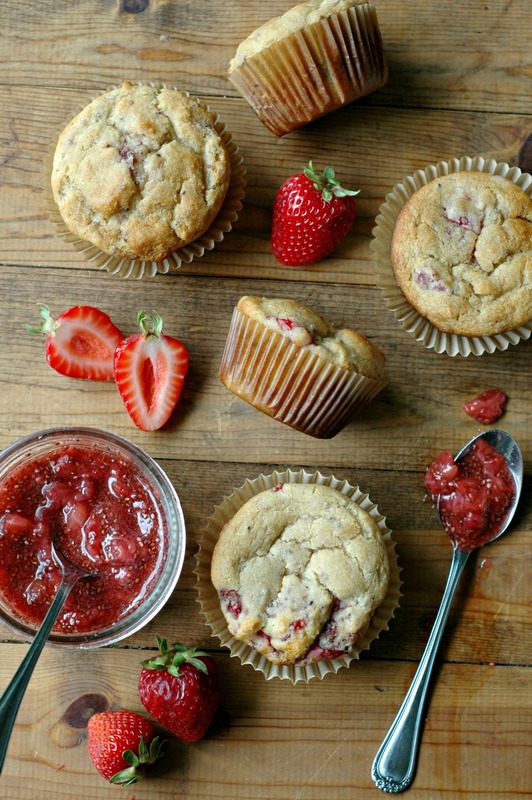 Boy oh boy – these muffins with that jam look SO DELISH! YUM! I’ve been baking more with cassava four. These look amazing!! OMG ! I can totally imagine the flavor of these muffins ! I have a pot of strawberry compote at home now I’m going to turn them into muffins too. SO YUM ! I want to make both the muffins (I have all the ingredients!) and the chia jam — Have made chia jam before but I am going to try your recipe!! YUM!! It’s Wimbledon at the moment so time for strawberries! Thanks for this great recipe. Hi Yasemee! Yes, they do! Hi Yasemee! Great! I’m glad you enjoyed them! These look absolutely divine. WANT THEM NOW! !